The first Portuguese expedition to the Moluccas under the command of António de Abreu arrived in Amboina and on the Banda islands in 1512. After an adventurous voyage he went back to Malacca. Francisco Serrão and other members of this expedition wrecked on a reef off Lucopino island (Nusa Penju) not far from Ambon island, but somehow managed to reach first Ambon and then Ternate. There the Sultan of Ternate adopted Serrão as his personal councilor and made him and his companions prominent figures of his royal court. From 1513 the Portuguese sent an annual trading fleet to the Spice Islands. The first under Captain António de Miranda de Azevedo opened two small “feitorias”, one in Ternate and one in Batjan. On Febraury 1522 the Portuguese captain António de Brito came to the Banda islands and strengthened the friendship with the King of these islands. To mark this event they erected a stone “padrão” with the arms of the King of Portugal. António de Brito arrived in Ternate in May of 1522, when he built the fortress of São João Baptista de Ternate. 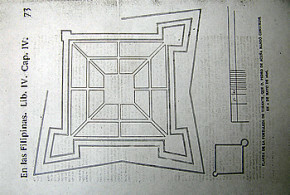 The foundation stone of the fortress was laid on June 1522. The Jesuits soon started a school in Ternate. The Portuguese rule in these islands was always weak. This was due to the remoteness of the islands and to the small number of Portuguese , who arrived there; the Europeans were never more than a few thousand. 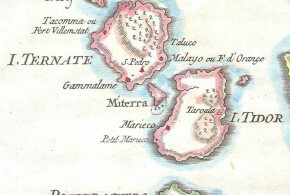 Several Spanish expeditions arrived in Tidore; the first was that of Magalhães. 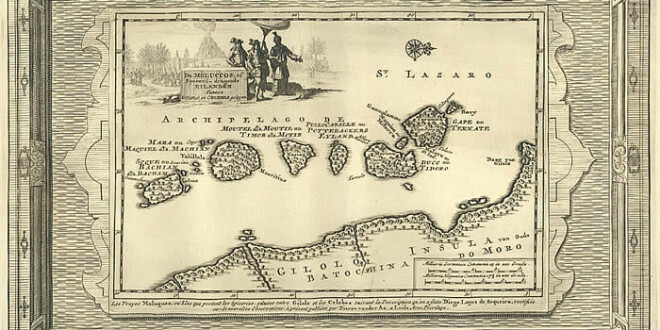 The Spaniards settled in Tidore and annoyed the Portuguese for many years. On 25 October 1536 the Portuguese governor, António Galvão arrived in Ternate. He was a good governor, reconciling, organizing and evangelizing the Moluccas. He was also the builder of the Portuguese town of Ternate, he built a school and a hospital and had a stone wall built all around the town. António Galvão is worshipped as the apostle of the Moluccas. On 15 July 1575, the Portuguese surrendered the fort to the Ternatese. 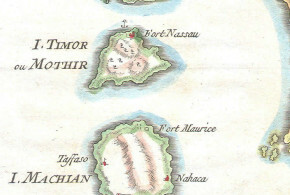 The Portuguese fort of Ternate. The Spanish town of Ternate: Ciudad del Rosario. – Andaya, Leonard Y. “The world of Maluku: Eastern Indonesia in the early modern period” University of Hawaii Press, 1993, Honolulu. – Argensola, Bartolomé Leonardo “Conquista de las islas Malucas” 372 pp. EdicionesPolifemo, 1992 (1609), Madrid, Spain. – Des Alwi & Hanna, A. Willard “Turbolent times past in Ternate and Tidore” (also for the Dutch history) 290 pp. Rumah Budaya 1990 Banda Neira, Moluccas, Indonesia. – Jacobs, Hubert “A treatise on the Moluccas c. 1544. Probably the preliminary version of António Galvão’s lost História das Molucas” x, 402 pp. Sources and studies for the history of the Jesuits n° 3, Institutum Historicum S. I., 1971, Roma, Italia. – Jacobs, Hubert “Documenta Malucensia” Vol. I-II-III Vol. I 1542-1577. XLII-84*-760 pp. (vol. 109). Monumenta Historica Societatis Iesu, 1974, Roma, Italia. Vol. II 1577-1605. XXXII-65*-794 pp. (vol. 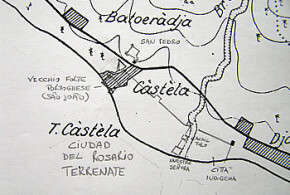 119). Monumenta Historica Societatis Iesu, 1980, Roma, Italia. Vol. III 1606-1682. XXIV-54*-778 pp. (vol. 126). Monumenta Historica Societatis Iesu, 1984, Roma, Italia. – Perez, Lorenzo OFM “Historia de las misiones de los Franciscanos en las islas Malucas y Celebes” In: “Archivum Franciscanum Historicorum” vol. VI (1913), pp. 45-60, 681-701; vol. VII (1914) 198-226, 424-446, 621-653. – Pinto da França, A. “Influência Portuguesa na Indonésia”, in: STUDIA N° 33, pp. 161-234, 1971, Lisbon, Portugal. – Rebelo, Gabriel “Informação das cousas de Maluco ……. 1569” 1856 & 1955, Lisbon, Portugal.